Part of being a veteran is knowing the reality of a situation; to not sugar coat things and see them for what they truly are. It is with this veteran insight that Dennis Hallman recently spoke to MMAWeekly.com about his upcoming UFC 117 fight, he said, “My back’s kind of against the wall. At 34 years old and coming off a knockout loss in his last UFC bout, Hallman knows the door may be closing on his major league opportunity sooner than later. While time may be working against him, he does have one ace up his sleeve. Hallman was recently diagnosed with Celiac Disease, an autoimmune digestive reaction to wheat, which hindered his ability to recover properly from physical activities such as training and fighting. Having found out the problem and taken steps to correct it, Hallman says things are definitely on the upswing. “I’m not completely healed yet, but it’s already 100-percent better than it’s ever been,” he stated. “I have 100-percent better cardio than I’ve ever had. 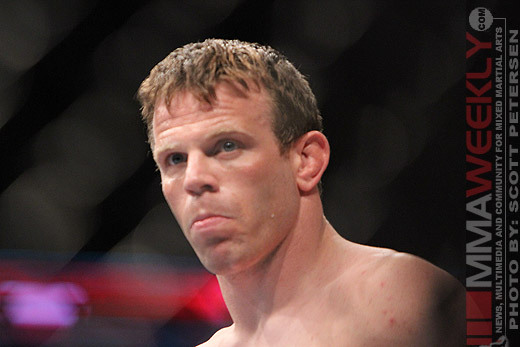 Hallman’s newfound health has had an immediate impact on how he trains and prepares for fights. After eight months off from fighting, Hallman returns this Saturday at UFC 117 against Ben Saunders; who is also looking to rebound off a loss in his last fight. A veteran of nearly 60 fights, Hallman feels his experience will also play a key factor in the fight. Spurring on Hallman is his teammates at Victory Athletics, of whom many also have fights coming up this month. Hallman may be up against the wall once again, but having dealt with a longtime issue that hampered his performance and of clear mind to exactly what is at stake at UFC 117, he may be the last person you want to bet against Friday night.